The General Knowledge: What does Venus look like? Venus is referred to as Earth’s sister. Venus is parallel to the size of our planet, but the likeness ends here. 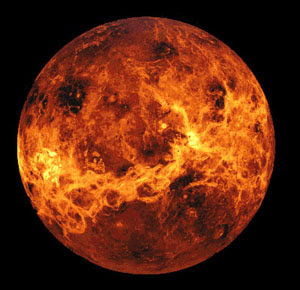 Venus temperature on the surface of the planet is nearly 500 degree Celsius. Its air is heavy enough to crush a human in seconds. Its atmosphere consists partly of an acid. Venus is always brighter than the brightest stars. This is bright enough to be seen even in the middle of the day. We can see that Venus is a planet once ruled by volcanoes if we look past the clouds. However, there is no evidence that these volcanoes still active today. **Fact: Because Venus was the Roman goddess of love, astronomers have named many of the planet's features after the famous women.